The "Uterus" incident is getting really interesting. Quick recap: Last week on the floor of the Florida House of Representatives, Rep. Randolph, suggested if his wife (the fabulous Susannah Randolph!) were to incorporate her uterus, the Republican party wouldn't be interested in regulating it. The Speaker of the House, Dean Cannon, sent word that Randolph was not to discuss any body parts on the House floor and that "uterus" is not appropriate for the young pages to hear. The incident exploded on social media and was picked up by Mother Jones, Salon.com and Rachel Maddow. Click here to watch Rep. Scott Randolph, on Rachel Maddow. "One of the reasons why he is probably one of the least effective members of the Democratic caucus is he substitutes things that have provocative value or shock value rather than making a policy argument,” the Winter Park Republican said. “Not only have I not spoken to him, not reprimanded him, nor had any conversation with him, we haven’t banned the word ‘uterus’ from the floor.” Sassy! Become a member of the Uterati! 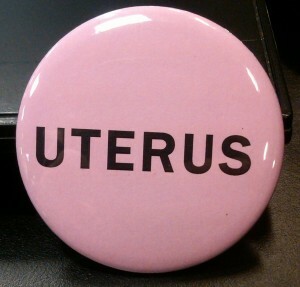 Get your official "UTERUS" button by clicking here.